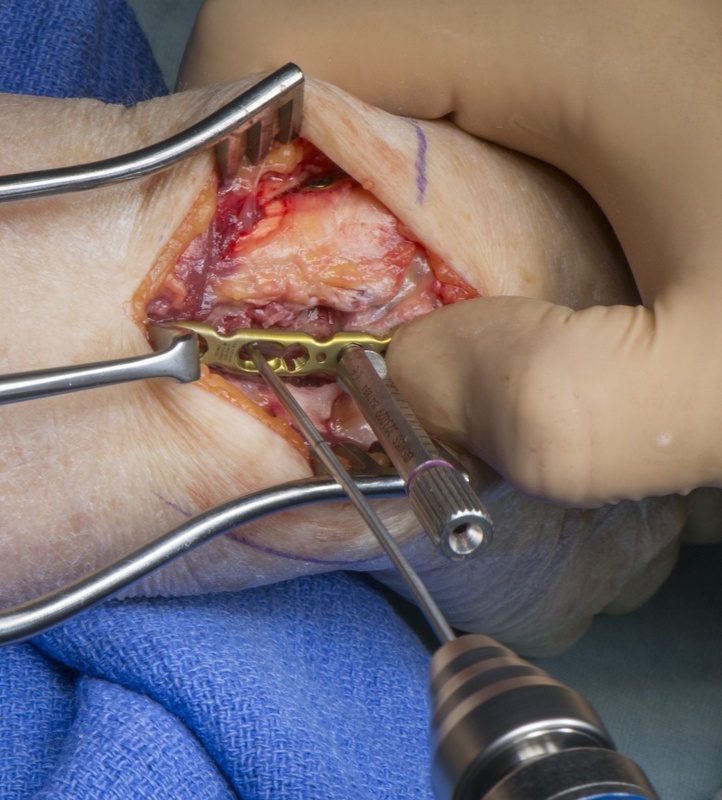 Learn the Distal Radial fracture fixation with dorsal approach and Synthes 2.4mm variable angle plating system surgical technique with step by step instructions on OrthOracle. Our e-learning platform contains high resolution images and a certified CME of the Distal Radial fracture fixation with dorsal approach and Synthes 2.4mm variable angle plating system surgical procedure. This is a detailed step by step instruction through fragment specific dorsal plating of a distal radius fracture using Depuy SynthesTM 2.4mm variable angle plating system. This is a procedure undertaken for complex comminuted intra-articular distal radius fractures. It allows for fragment specific fixation of the fracture and can be combined with arthroscopic assessment if necessary. The post-operative regimen will depend on the complexity of the fracture and the confidence of the surgeon in the hold of the fixation. Commonly the patient is placed into plaster cast for 7-10 days for comfort and to allow post-operative swelling to settle and then mobilisation begins with the hand therapy team with a Futuro wrist splint to be used for comfort at the patients discretion. Heavy loading of the wrist and aggressive passive exercises are not started before 6 weeks post-operatively.